On the SES show in Magdeburg January 7 billed as "Schwere Jungs" (Heavy Boys) former EU and WBC Youth heavyweight ruler Francesco Pianeta, 24-0-1, continue his comeback after leaving Sauerland. Pianeta face veteran Zack Page in a scheduled eight-rounder. Page is a frequent visitor to Germany and have taken all opponents to school with his know-how, experience and conditioning. Pianeta, a southpaw, have in the past showed a lot of talent and power but also a bad tendency to lose concentration and Page got all the right moves to make Francesco look bad but may not have what it takes to cause an upset. 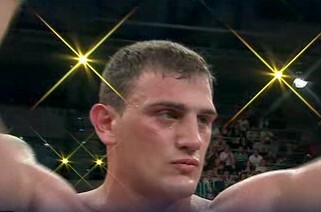 In the headliner lightheavy Robin Krasniqi defends the WBO European title against Frenchman Hakim Zoulikha. SES also have female triple world champ Ramona Kuehne on the Robert Stieglitz vs Kim Weber show in Offenburg January 14 defending her titles against Hungarian Agota Ilko.